Last week’s ConCourt ruling on temporary employees brought much-needed stability for some, but could spell doom for labour brokers. A leading staffing solutions guru says while last week’s Constitutional Court ruling on hiring of temporary employees has brought uncertainty to millions of workers and labour brokers, all is not lost as the answer lies in innovation. Innovative Staffing Solutions (ISS) managing director, Armoux Maré the recent Concourt’s judgement, which required that workers provided by labour brokers to companies should become permanent employees of the client company where they were placed after three months with a job security, has put the spanner in the works. He was explaining the impact of the ruling in a media briefing in Johannesburg yesterday. The ruling is known as the “Numsa Clause”, named after the National Union of Metalworkers of South Africa which challenged the dual interpretation of the amendment to Section 198 A (3)(b) of the Labour Relations Act (LRA) by labour brokers that were intent on controlling casual workers. Maré said as a result of the ruling, many workers were unsure about what the future held for them. He welcomed the Concourt ruling for having effectively changed the lives of hundreds of thousands of workers for the better. “The groundbreaking judgement essentially freed low-paid workers often exploited by labour brokers, giving them much needed security. 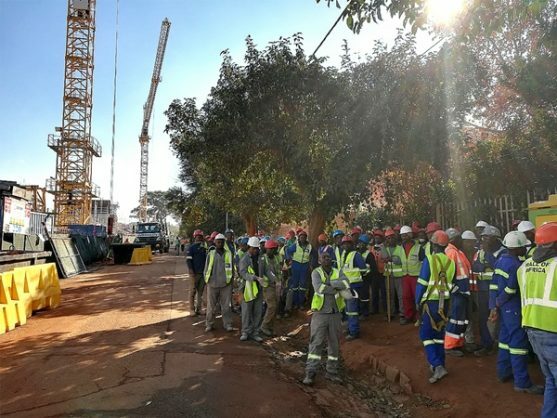 In the past the majority of these workers could not apply for a loan or a house bond due to their temporary employment status, the status quo has therefore changed in their favour,” Maré said. Due to the LRA amendment there was uncertainty as to whether there should be a sole or dual employment relationship between the labour broker, its client and the placed worker. Drawn-out court battles ensued as a result of the different interpretation of the LRA amendment between trade unions and labour brokers. The LAC set aside an earlier Labour Court ruling by saying that a placed worker who had worked for a period in excess of three months no longer performed temporary services and must become a sole employee of the client company instead of the broker. The landmark ruling, which found that the sole employer interpretation best protected the right of placed workers and served the purpose of the LRA, was hailed throughout the country and Numsa was showered with praises for its resilience in fighting for the workers’ rights. Numsa general secretary, Irvin Jim said the ruling was a precursor towards a complete ban of labour brokers in the country. “This is a major victory for casual workers who are abused by labour brokers. We view this as the first step in ending the labour brokering system in South Africa,” Jim said. According to Maré in terms of the change, the temporary employment services would not have any legal standing in the employment of contract workers and would not feature in the LRA equation. At the same time, while the ruling brought about much needed stability for some, it spelt doom for others as some workers were unsure whether they would retain their jobs in the near future and labour brokers faced a bleak future. He appealed to companies that used the services of labour brokers not to dismiss short term workers as a means to avoid permanently employing them, but to rather find a way finding a way forward via specialists like Innovative Staffing Solutions (ISS). He said ISS, unlike a labour broker, is a staffing outsourcing company that gets physically involved with employees. It takes over contracts of labour brokers and provides permanent employment to workers with full benefits and protection by labour laws. “We outsource operations. We did not start as a labour broker, we built our company with the same idea we have today. We protect our method of doing business and that’s why we do well,” Maré said. The firm, which has its headquarters in Pretoria with offices in major cities countrywide and several satellite offices, has good relations with all the trade unions they deal with.